Note: The Little Falls Historical Marker is erected by the site of the Lower Crossing, while the description in its text refers to the action at the Upper Crossing, two miles upriver. The Army of the Potomac arrived at Falmouth on November 15, but they could not cross the Rappahannock River to Fredericksburg without bridges, and civilian bridges had been burned months before. General Ambrose E. Burnside had ordered pontoons to be sent to his army at Fredericksburg, so they could build the necessary bridges to cross and face the enemy. But the pontoons weren’t there—they had not even been sent yet. A combination of miscommunication and misunderstanding the urgency of the delivery led to delay. Had the army received its pontoon wagons with necessary building materials when they reached the Rappahannock, they would have been able to build bridges in a timely manner, with a two-day head start in front of the Army of Northern Virginia. Unfortunately for the Federals, Lieutenant General James Longstreet’s corps began reaching Fredericksburg the night of November 20, and soon after that his Confederates set to work constructing earthworks and fortifying positions for artillery placement. Burnside would not march to Richmond without a costly fight. Once the pontoon wagons arrived, Mother Nature delayed the crossing further, with harsh, rainy weather. Two weeks passed before Burnside could attempt to cross. Early on the morning of December 11, Union engineers finally began building pontoon bridges at what they called the Upper, Middle, and Lower crossings (above). Major Magruder of the Fifteenth New York Engineers and Lieutenant Charles Cross of the Regular Engineers, Sappers, and Miners, were responsible for laying three bridges below town, by Little Falls. They started with secrecy, for the Confederates expected pontoon crossings farther upstream from the town and were unaware of Federal actions downstream; thus the Fifteenth New York met with relatively little resistance (O’Reilly 70). 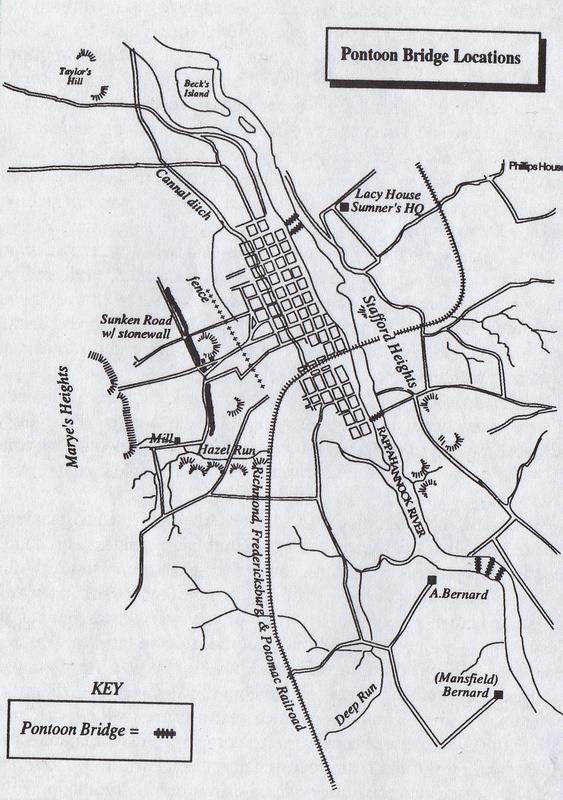 Magruder’s engineers were able to nearly complete the upper two by 8:15 in the morning, before the Confederates realized their presence and actions and commenced firing. Yet the return fire from Union 12-pounder Napoleons proved too much for the exposed rebels to take on, and engineers completed the two bridges by 9:00 (72). The regiment then went to help the Fiftieth New York finish building the bridges upstream (Finfrock 62). It took Lieutenant Cross longer to complete the lowest of the three bridges. Although they arrived at Stafford Heights at 3:00 a.m., it took his troops nearly two hours to get their pontoons and materials down 200 yards of steep, unaccommodating ground to the bank where they would begin building. By 8:15 when the Confederates began firing at them, they had finished only half of their bridge. It was not until 11:00 that After three and a half hours of work slowed much by ice, Cross’s bridge was fully finished and finally ready for General Franklin’s Left grand Division to cross (O’Reilly 70-73). Contrary to the relative ease with which the lower bridges were constructed, those at the Upper Crossing (below) had no such luck. Two bridges were to be laid across the 400-foot-wide river opposite the town of Fredericksburg, by the 50th New York Engineers. But before they could build even half of a bridge, the fog protecting them lifted, and Confederate sharpshooters from the opposite shore, under General William Barksdale, began firing at the engineers, picking them off as they tried in vain to build. The time was only 5:10 (O’Reilly 65). It was clear that the Federals would not be allowed to cross into Fredericksburg without a fight. Every time the engineers tried to go back out and finish the bridge, they were repulsed by enemy fire, falling where they stood, into the boats or water, or fleeing back to shore. In the words of one Union officer, “it was simple murder, that was all” (66). Some time after 9:00, Federal batteries began shelling Fredericksburg, crumbling buildings, so the engineers could continue their work (Finfrock 55). A little over an hour later, Burnside gave orders for the artillery to flatten the town. Artillery positioned atop Chatham Heights blasted away for another hour, raining destruction upon buildings across the river, setting quickly-spreading fires, and scattering and killing many of the 17th Mississippi regiment (Finfrock 57). The Federals felt that should be enough to stop the sharpshooters from firing at them. They were wrong. The Confederates were just as alive and dangerous as ever. Meanwhile, the bridge at the middle crossing met a similar sort of resistance, and consequent delay, from the town sharpshooters as did those at the upper crossing. A detachment of the 50th New York Engineers, commanded by Captain James McDonald, was assigned to build it. There, however, unlike at the upper crossing, the Federals were able to build two thirds of the span before they were forced back by Confederate fire. The 89th New York infantry supported the engineers with artillery fire, and in late afternoon their commander, under orders from Burnside, selected four 25-man detachments to cross in pontoon boats, and take certain points, while covered by the artillery. They were successful, even capturing sixty-five prisoners, and remained until the engineers were able to finish the bridge. Only once a detachment of the 15th New York Engineers arrived from the lower crossing to assist them could the bridge finally be completed (Harrison 97-99). Late in the afternoon, a new solution for building the bridges was designed—the same tactic simultaneously used at the middle crossing. Volunteers of the 7th Michigan regiment crossed the river in the awkward pontoon boats, in what was “the first bridgehead landing secured under fire in the annals of the United States” (O’Reilly 83). Once ashore they hunted out Confederate snipers, with both sides having “the first taste of street fighting ever known on the North American continent” (100). It achieved its purpose, as the Federals killed and captured a significant portion of the rebel sharpshooters and made it safe enough for their engineers to continue building the spans. By dusk the, 50th New York was at work again on the bridge, and was able to complete it after nightfall, in time for Major General Edwin V. Sumner’s troops to cross for the night. During the next day, many Union troops looted homes in the town, smashing valuables, much to the disapproval of upper officers, while Burnside took more time to prepare for an attack the following day. The day after that, December 13, commenced the intense Battle of Fredericksburg. “Pontoon Bridge Locations,” Bradley Finfrock, Across the Rappahannock, Bowie, MD: Heritage Books, 1994, 54. 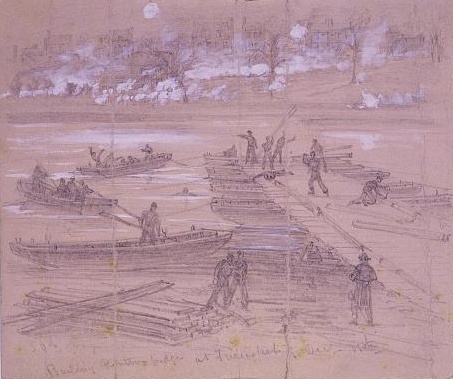 Sketch by Alfred R. Waud, “Building Pontoon Bridges at Fredericksburg Dec. 11th,” Library of Congress. Greene, Wilson A. “Battle of Fredericksburg.” National Park Service. http://www.nps.gov/frsp/fredhist.htm (accessed April 20, 2008). Harrison, Noel G. Fredericksburg Civil War Sites: April 1861-November 1862. Lynchburg, VA: H. E. Howard, Inc., 1995.